Eau Claire band Rivers breaks in the "Eau Claire-Stream's" fold out stage. What’s the best way to see America in style? 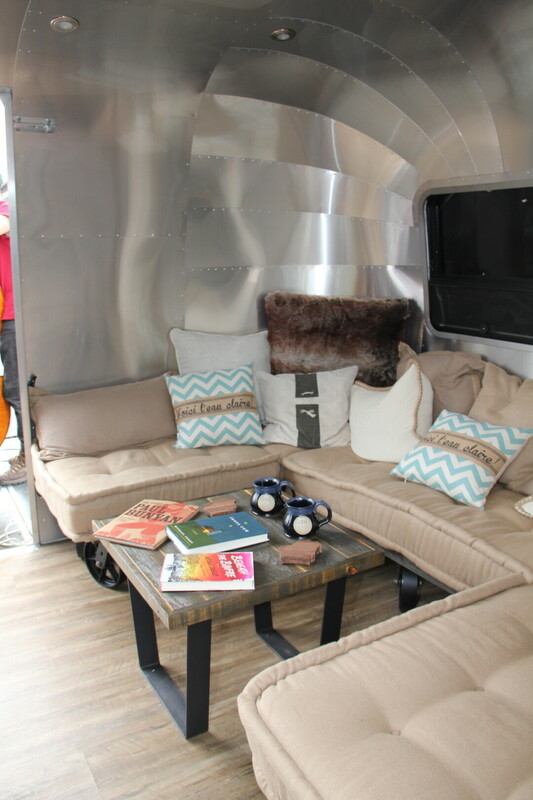 Inside the sleek, retro luxury of a shimmering aluminum Airstream trailer, of course. What’s the best way to stylishly impress the rest of America so they want to check out the Chippewa Valley? Again, with a classic Airstream trailer – coupled with the talents of Eau Claire area musicians, performers, writers, and other creative folks. The trailer, unveiled Thursday afternoon, features a nifty fold-out stage, essentially creating a pop-up performance venue complete with sound and video systems. 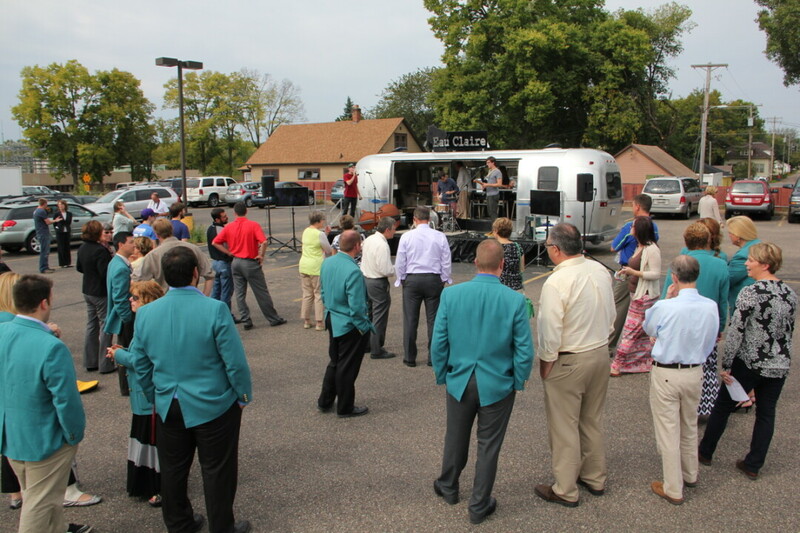 At a launch party in the downtown parking lot of Stella Blues, Eau Claire indie rock trio Rivers serenaded the crowd from atop the stage, which runs nearly the entire length of the trailer. 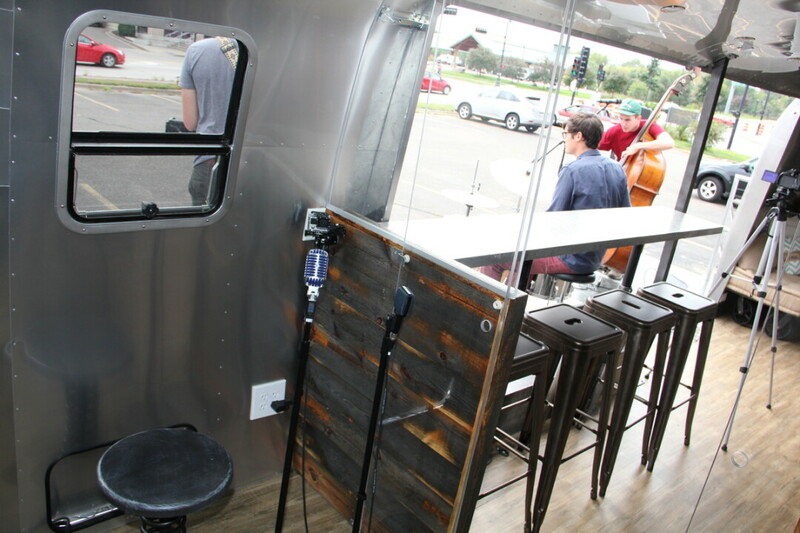 The Eau Claire-Stream includes a mobile recording studio. “We believe a presence like this for Eau Claire will really set us apart,” said Linda John, executive director of Visit Eau Claire. 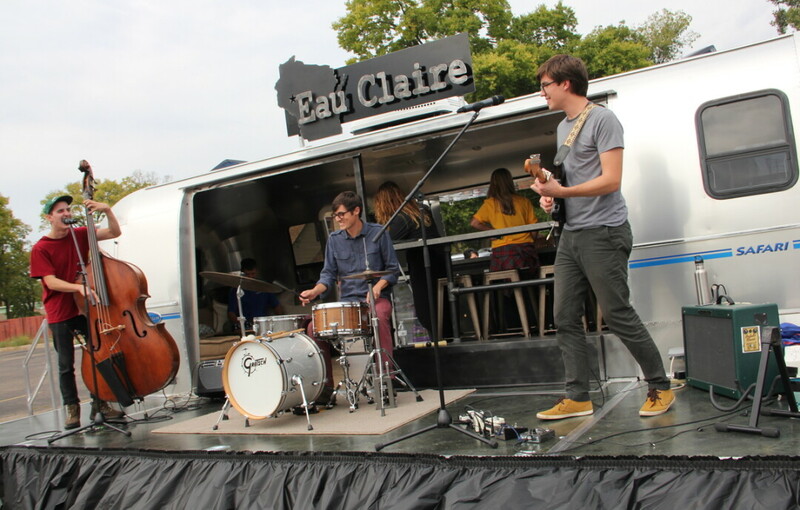 Unlike the Fun Patrol – which Eau Clairians have become accustomed to seeing generating enthusiasm at countless local events in the past few years – the Eau Claire-Steam is intended to tour the Midwest and entice visitors with the help of local talent. “It’s able to go on the road and share the Eau Claire experience with the rest of the world,” John said Thursday. Initially, the Eau Claire-Stream is expected to make six to eight multi-city tours a year within a 300-mile radius, an area that includes most of the Upper Midwest. The trailer will make its promotional debut in Minneapolis on Monday at the Association of Great Lakes Outdoor Writers conference. Again, Rivers will take the stage in the first of what Visit Eau Claire intends to be many forays by Chippewa Valley performers into the wider world. John said the Eau Claire-Stream is the brainchild of a strategy session earlier this year, where such mobile marketing centers were identified as a notable industry trend. And the Eau Claire-Stream isn’t just sleek and cool on the outside: Inside, the trailer has wood flooring and cabinets, as well as shiny aluminum walls. On one end there’s a cozy couch decorated with Eau Claire pillows and a coffee table strewn with local books (items that will look familiar if you’ve been to The Local Store); at the other end, there’s a mini recording studio with a sound system, microphones, and a laptop, equipment that also controls the sound from the stage. In addition, a GoPro video camera broadcasts what’s going on in the studio to monitors outside. And, on the side of the trailer opposite the stage, a window folds down to create a perfect place to serve samples of local food and beverages. The trailer and customization – the latter done by Colorado-based Timeless Travel Trailers – cost $130,000, with an additional $20,000 invested in the sound system. The cost will be spread over five years, John said, and will be paid for with some of the money that Visit Eau Claire previously devoted to advertising and the Fun Patrol. While that will mean less traditional advertising, John expects the Eau Claire-Stream will attract more of what marketers call “earned media” – stories on TV stations, newspapers, blogs, and the like. And while the Eau Claire-Stream will spend most of its time on the road, John says you can expect to see it in town for a few major local events a year – so keep your eyes open and your ears peeled.